Feat. Waka Flocka Flame, Scarface, Faith Evans, Chase N. Cashe, Smoke Dza, Brand Nubian, Doug E. Fresh, Joe Budden, Dead Prez, Casey Veggies, DMC, OG Maco & More Artists To Be Announced! Panels Led By Tuma Basa (Spotify), Lenny S. (Roc Nation), Steve. O (Def Jam), Rob Markman (Genius) And More Industry Leaders! Last year’s SOURCE360 featured on The New York Times, New York Daily News, Billboard, REVOLT TV, Village Voice, Amsterdam News, and more! 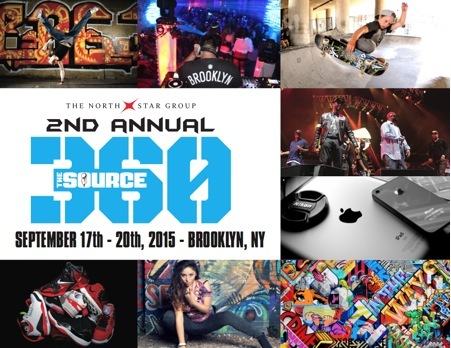 New York, NY – September 2, 2015 – Tickets are now available for the second annual SOURCE360 Festival, presented by The NorthStar Group and The Source Magazine. Purchase tickets here: http://bit.ly/SOURCE360tix. The upcoming SOURCE360 Festival, to be held in downtown Brooklyn from September 17th – September 20th, will feature over 20 activations to engage the community through music, sports, fashion, film/TV, art, dance, and technology. SOURCE360 is also focused on educating the youth and inspiring the community in numerous pro-social activations and programs. For more information, please visit: http://thesource360.com/. The SOURCE360 celebrations will take place throughout the Brooklyn Cultural District and festivities will include signature concerts, thought leadership panels, youth education and training sessions, nightly private shows, brunch celebrations, a beauty bar, nightlife events and more! In addition, the SOURCE360 Festival Block Party on Saturday, September 19th on Rockwell Place will host activities on street art, fashion, break dancing, poetry slams, a Kids360 talent show, DJ spinning, music performances and more. The SOURCE360 Concert Series will take place throughout the week and will feature musical performances by Waka Flocka Flame, Scarface, Faith Evans, Chase N. Cashe, Smoke Dza, Brand Nubian, Doug E. Fresh, Joe Budden, Dead Prez, Casey Veggies, DMC, OG Maco and other special guests, as well as surprise pop-up concerts. SOURCE360 will also feature a very special tribute party to The Notorious B.I.G. in his hometown and neighborhood. Venues include prominent cultural institutions such as BRIC, Mark Morris Dance Center, Roulette and more! SOURCE360 celebrates the innovation and creativity inspired by Hip-Hop and represents Brooklyn’s diverse cultural tapestry. SOURCE360 is more than a festival and hub of creative performances. Education and thought leadership is essential to the mission. One of SOURCE360’s goals is to increase awareness and interest in higher learning among middle school and high school students through the filters of music, film, fashion, sports, technology and the performing arts. The SOURCE360 Educate & Elevate program and Youth Training Day will expose them (especially at-risk youth) to information and opportunities relating to colleges, universities, career paths, corporations and community service organizations. The SOURCE360 Speaker Series will feature panel discussions conducted by thought leaders and entrepreneurs in the art, music, film & television, media, tech, and fashion industries. Industry and community leaders such as Tuma Basa (Spotify), Lenny S. (Roc Nation), Steve O. (Def Jam), Rob Markman (Genius), Lisa Evers (Fox, Hot 97), Yandy Smith-Harris (VH1’s Love and Hip-Hop), Reggie Saunders (Jordan Brand), Tracey Snyder (NFL), Gareb Shamus (Comic Con), Angela Simmons, (Celebrity Entrepreneur), Tai Beauchamp (TLC’s Dare to Wear), Miko Branch (Miss Jessie’s), April Walker (Walker Wear), Dr. Charles Johnson-Bey (Engineer), Maya Azucena (Singer-Songwriter), Carmen Perez (Justice League NYC), Mysonne (Artist), Malcolm Lee (Film Director), Mayor Ras Baraka (Mayor of Newark, NJ), L. Londell McMillan (Attorney and Publisher) and more to be announced, as they are expected to participate in interactive panels and events. Attendees will have the opportunity to build their professional network, have fun, and gain new insights. To highlight Hip-Hop’s up-and-coming talent, SOURCE360 will also be hosting The Unsigned Hype Competition. Credited for discovering artists such as Biggie Smalls, Eminem, Common, and Kendrick Lamar, The Unsigned Hype Competition allows unsigned artists to battle it out for the opportunity to join a storied lineage of rappers, artists, and creators to perform live on stage. The Unsigned Hype Vol. 1 Mixtape featuring finalists from last year’s competition at SOURCE360 will be available soon on all streaming and digital distribution platforms. Submissions are officially open for this year’s Unsigned Hype Competition: http://bit.ly/1PCrYug. Having launched for the first time in 2014, SOURCE360 gathered 38,000 attendees over 4 days, with 47 artists, 32 bloggers, 45 speakers, 15 DJs, and 21 activations. Performers from the inaugural year included Wu Tang Clan, Dom Kennedy, Lil Kim, Bone Thugs N Harmony, The Diplomats and more! We are accepting Press Requests for The SOURCE360 Festival. Press interested in receiving credentials should fill out this form and will receive a response closer to the event: http://bit.ly/SOURCE360Press15. LOCATION: Various venues in Downtown Brooklyn including Roulette, BRIC, Mark Morris Dance Center, Woodland, and Milk River.